If you want your property to look its best, then you’re going to need a high quality lawn mower. There are a number of options on the market today, including corded electric, battery powered, riding lawn mowers and gas lawn mower models. Although electric corded and battery powered mowers are becoming more popular with each passing year, there is still a huge market for gas mowers, and some specific scenarios where they are more suitable. If you’re new to lawn mowers and you’ve taken a look at our electric lawn mower reviews and buying guides, then it’s now time to learn about the gas powered alternatives. The key difference between gas powered lawn mowers and electric types, is the fact that gas models use a small capacity engine, similar to what you would find in a gas generator or even a chainsaw. An internal combustion engine can be reliable, robust, and can even last a lifetime, just as long as it gets the right care and maintenance. If you’re going to invest in a gas lawn mower, then you’ll need to invest in some learning time to become familiar with the engine components and maintenance steps. You’ll need to check oil and gas levels and replace when necessary, and you’ll also need to know how to change an oil and air filter. Gas lawn mowers use a spark plug to generate ignition, so this is something that you’ll need to become familiar with when it comes to removing and replacing the part. Overall, a gas mower will require more maintenance and parts than an electric mower, but the maintenance steps are not extensive. The average homeowner would simply need to replace gas and oil, change or clean a filter when it becomes dirty, or replace a spark plug every one to two years. Even if you’re not familiar with all of these steps and you don’t want to learn them, then you can enjoy the benefits of owning a gas mower while using a lawn mower service technician to give your mower a tune-up every year. A gas lawn mower has a heavy engine block made of iron or aluminum, the chassis will usually be made completely from iron or steel, and even parts like the topside of the body will be made from some type of metal alloy. This makes gas mowers heavier than a comparable electric mower, but companies do provide special features to offset the difference. Take Husqvarna as an example. Their gas lawn mowers use rear drive and all-wheel drive self-propelled technology. Essentially, they use the same energy that is used to spin the blade, to also drive the wheels. This is achieved with a system of belts and pulleys, and it means that moving your lawnmower requires less effort. If you have wanted to purchase a gas lawn mower but assumed the extra heft and weight would make it hard to operate, then going for a self-propelled version will alleviate any of those concerns. At the end of this article we’ll take a look at the Yard Machines 21” Self Propelled gas mower, which is a great example of modern technology with classic gas powered design. With a corded electric lawn mower, you will be limited to the length of your extension cable, and in most cases you won’t be able to go further than 150ft from an outlet. A cable can be cumbersome and it’s possible to trip or even run over a cable, which is one of the reasons that battery powered mowers are becoming more popular. Battery powered lawn mowers allow you to use an electric mower without the concerns of running a cable, however, they’re still not quite as portable as a gas mower. Once your battery pack is out of juice, there will be a long charge time before you can get mowing again, and even if you buy multiple battery packs it can become expensive and inconvenient for a large property. With the best gas lawn mowers, you won’t need to worry about running out of power, just as long as you have a gasoline can handy. A quick refile of your tank and your mower will be back up and running with negligible downtime. For professionals and for homeowners with large lawns, a gas mower can be more convenient and more practical. Gas is cheap and modern lawnmowers meet strict emission guidelines, so pollution won’t be a concern for most people. While electric lawn mowers can be compelling for smaller properties and light domestic use, any heavy duty work on longer grass or a larger property will always be easier with a gas mower. A typical gas powered mower is more powerful than an electric equivalent, and can run at maximum power without putting excess strain on the motor or battery. Although electric motors can provide exceptional amounts of torque, a lawn mower requires more power at high RPM. Whereas electric mowers can become bogged down in long grass and aren’t suitable for damp conditions, a gas powered lawn mower will provide enough power to mow any time that you need to. With a gas mower, you’re less likely to cause damage from running the mower at max power, and any intensive clearing work will always be better suited to gas lawn mowers. If you’ve decided at this point that a gas mower is more suited to your requirements, then you’ll need to know about a few of the options that are currently available. We’ve taken a look at three of the best gas lawn mowers to give you an overview of what they are capable of. The first model is the Yard Machines 159cc 21 Inch Self Propelled Mower. As mentioned earlier, a self-propelled mower is able to provide assisted drive so that pushing the mower around your yard doesn’t become a chore. This particular model has a 21 inch cutting deck, which is at the higher end of the mid-range when it comes to size. For a mower that is significantly larger, you’d be looking at a large riding/tractor style mower. The Yard Machines is height adjustable, and it uses 8 inch wheels to keep it stable and to make it easier to turn. 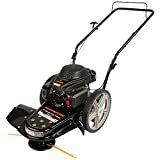 This is a relatively affordable lawn mower that includes many of the features that you will find on more expensive models, and it would be a great starter mower for the average sized yard. Click the link below to take a look at this particular model on the Amazon product page. The Remington 22 Inch Trimmer Lawn Mower is slightly larger, but in a practical sense the cutting deck size won’t make a huge difference over the Yard Machines model. However, this particular gas lawn mower has some other features which make it worth a closer look. It’s not a lawn mower in the traditional sense that it uses a blade, but it instead uses a string trimmer head that is mounted to a chassis with three wheels. This makes it perfect for clearing large overgrown areas, because the mower will never become bogged down. While it is more difficult to maintain an even cut with this mower, it is an excellent tool for professionals or large property owners. Again, check the link below for more information concerning features and current price on Amazon. We also found the Craftsman 37430 21 Inch 140cc 3-in-1 mower to be an excellent choice for homeowners. It’s a traditional lawn mower similar to the Yard Machines model. But it is a mulching mower as well as a standard mower. This means that it can continually cut grass inside the cutting chamber, until it is turned into fine clippings. Instead of catching these clippings in a bag, it redistributes them on the lawn so that they will eventually break down and provide nutrients to the soil and new grass. 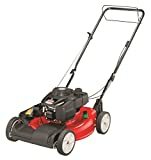 Of course, it includes a catch bag if you want to use it like a standard mower, and it has height adjustment, high 11 inch wheels for easy maneuverability, and it uses a high quality Briggs & Stratton gas engine. We have found electric lawn mowers to be ideal in many situations, but there are times when only a gas lawn mower will be suitable. If you want to perform heavy duty yard work, if you want to take your mower around a large property without worrying about a battery or power outlet, or if you simply want a gas mower because electricity is expensive in your area, then you’ll always have plenty of options. In addition to the models we’ve covered today, Husqvarna, Lawn Boy, and Troy-Bilt, are some names of manufacturers that make quality gas lawn mower models. If you want to learn more about mowers in general, including maintenance tips like blade sharpening, be sure to take a look at our lawn mower buying guides. DeWalt DWE7491RS vs Bosch 4100-09: Which Table Saw Is Better? Powertoolsninja.com is a participant in the Amazon Services LLC Associates Program, an affiliate advertising program designed to provide a means for sites to earn advertising fees by advertising and linking to Amazon.com. Amazon and the Amazon logo are trademarks of Amazon.com, Inc or its affiliates.